October 23, 2012 - The Experimental Aircraft Association (EAA) CEO, Rod Hightower on Monday resigned "effective immediately", directly after a Board of Directors meeting during which former Cessna CEO Jack J. Pelton was elected Chairman of the Board of Directors. 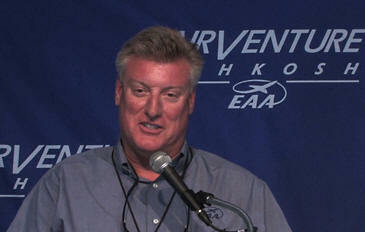 EAA is overseen by a Chairman, a President, a CEO and a Board of Directors. Back in 2010, 2010, it was announced that Rod Hightower would succeed Tom Poberezny as President of the organization, effective September 2010. Hightower indicated his resignation is a result of wanting to spend more time with his family. "Maura and I have five children ranging in age from pre-school to college freshman," Hightower said. "When I accepted the position two years ago I believed that we could as a family relocate to the Oshkosh area. But our family and school involvement have increased as our children advance in the schools they, and we as their parents, love. It would simply be too great a hardship on my family to move them to the Oshkosh area." said Hightower. Hightower will relocate from Oshkosh to St. Louis. The Experimental Aircraft Association (EAA) is an international organization of aviation enthusiasts based in Oshkosh, Wisconsin. Since its inception it has grown internationally with over 160,000 members and about 1,000 chapters worldwide. Pelton, retired as Chairman, president and CEO of Cessna Aircraft on May 2, 2011, ironically his separation was "effective immediately" and on a Monday. Pelton also worked at Douglas Aircraft for over 20 years. "I will be working closely with the EAA Board of Directors to ensure a seamless transition to a new leader," Pelton said. "The directors of EAA and I thank Rod for his service. We understand how difficult it is to relocate a family of school-age children." When Pelton was at Cessna, it was revealed that Pelton claimed he had a bachelor and a master degree in aerospace engineering, but it tuned out the degrees received were through a diploma mill. Embarrassed by the publicity, Cessna’s parent company, Textron released a statement proclaiming that Pelton was chosen for his 30-year-long career in leadership and not for his faked diplomas. "EAA, as all of aviation, faces many challenges with the continuing economic slump and the decrease in personal aviation participation. As an association we must remain focused on the original mission of our founder, Paul H. Poberezny, to welcome all members no matter what they fly, celebrate our volunteers, and treat our employees fairly," Pelton added.